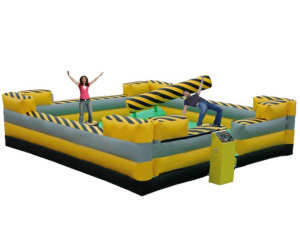 Our version of this game is similar to the one on TVs American Gladiators. 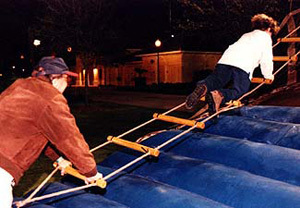 The two participants climb atop and stand in the middle of two adjustable height, 24-inch wide pedestals. 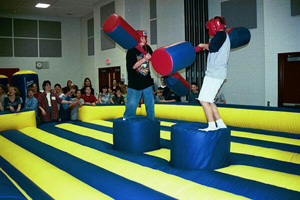 The gladiators strike, swat and nudge each other with oversized, foam padded jousting poles, trying to knock each other off of their respective pedestal. 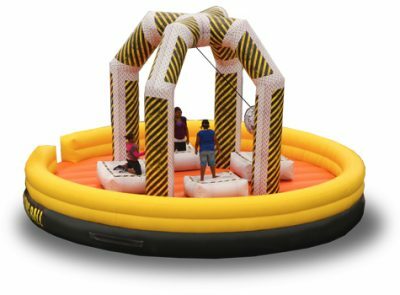 This game is safe since the gladiators wear padded gloves, head and face protecting helmets and are surrounded by a 19ft. by 26ft. 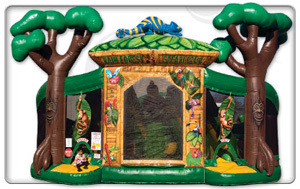 inflatable playing surface. 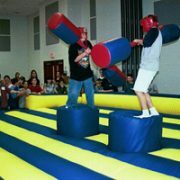 Since it is a game of balance, David can beat Goliath. Sixty people per hour can play.